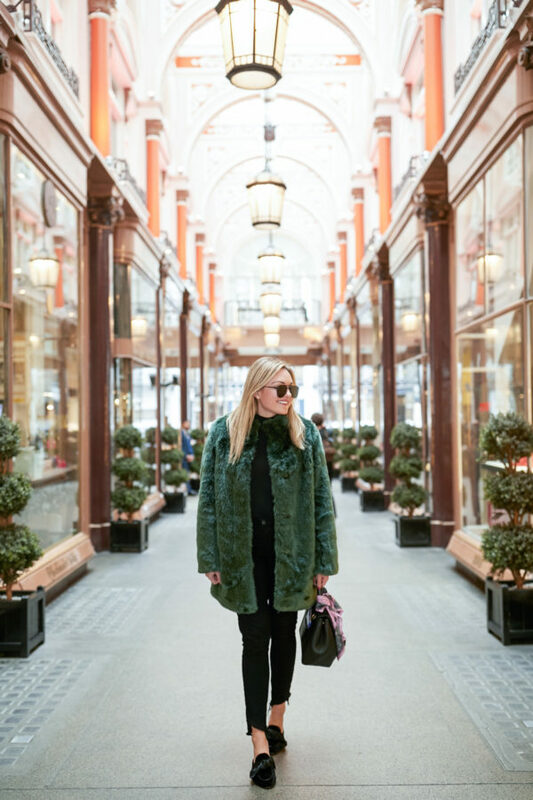 It’s been a whirlwind since I got back from London last week! I got back to Chicago late on Friday night and flew to Austin on Saturday for Austin City Limits with a few of my girlfriends. It was SUCH a fun weekend, which was much, much-needed. Long story short, I came down with food poisoning last Wednesday night and had to stay in London an extra day before I was able to hop on a plane to come home. I had a pretty crazy travel day trying to get back with a missed connection and crazy flight delays. Originally, I was supposed to head to Austin on Friday morning and once I finally got back to Chicago on Friday night, I was going to scrap the Austin trip all together. But I’m so, so glad I ended up going! It was a quick 36 hours in Texas (flew back to Chicago on Monday afternoon), but I’m already looking forward to my next trip to Austin to see more of what the city has to offer. 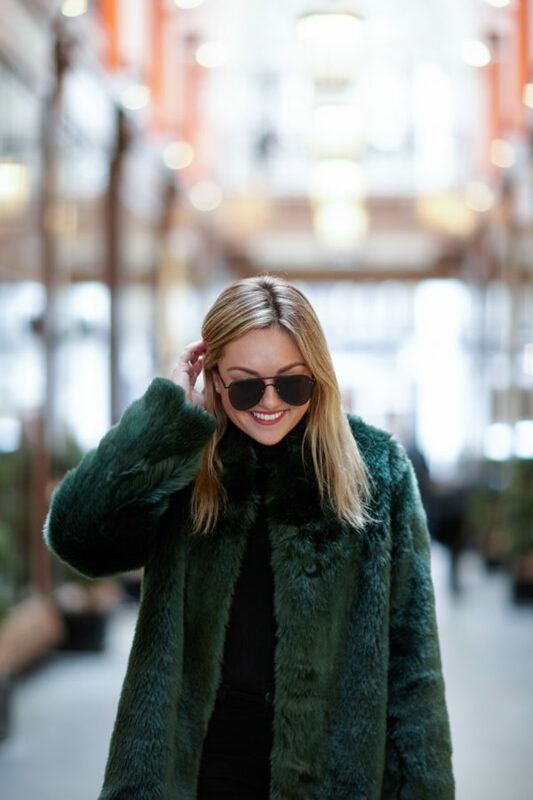 I wore this green faux fur coat a few times last week and got so many questions about it on Instagram and Snapchat, so I wanted to make sure I posted this outfit quickly to share where to shop! I popped into the new Aritzia by my apartment a few weekends ago and I was like a moth to a flame when I saw it in the store. 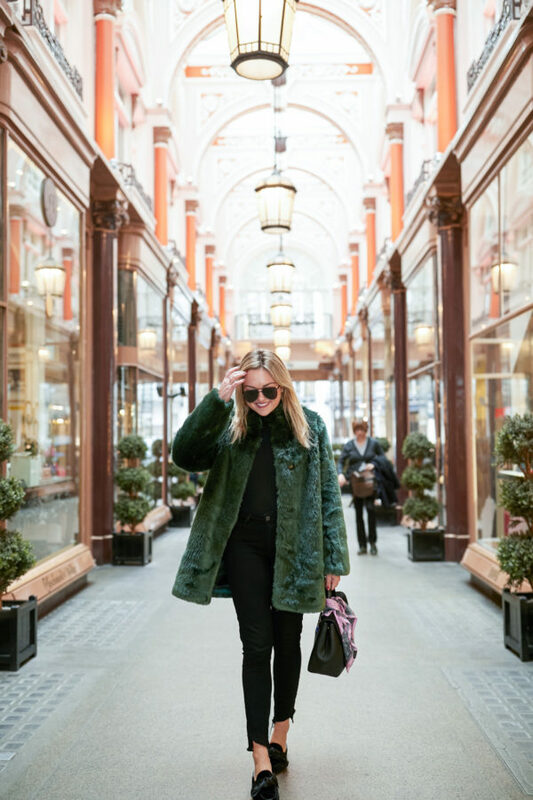 Dark green is my favorite color to wear and there’s nothing I love more than a statement coat in the fall and winter! In an effort to try not to impulse buy, I walked out of the store without it, but I instantly knew I had to go back. Thankfully it was still there when I went back the next morning… It was perfect for my trip to London! When I arrived in London early last Monday morning, I had a few hours to get settled in my hotel before heading out for a full day of exploring the city. The jetlag was setting in so I knew I needed to wear something that was comfortable, but obviously I wanted to look put together since it was a work trip! 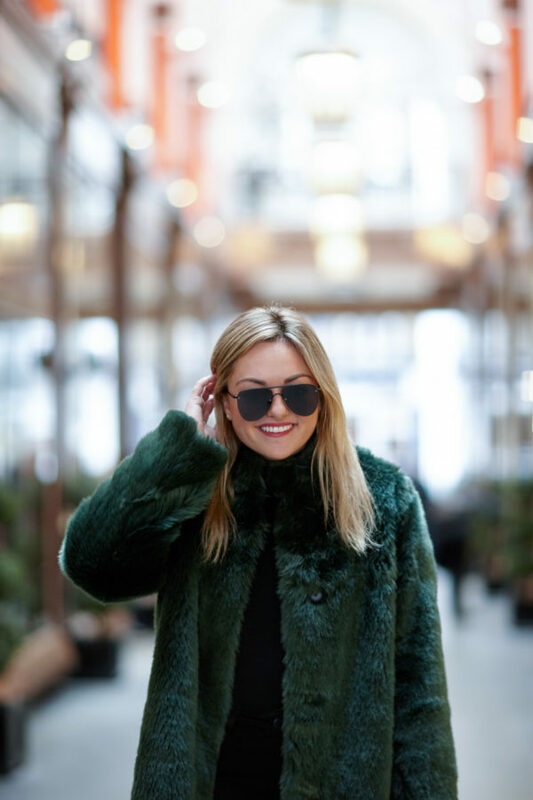 I kept it simple with a turtleneck bodysuit, black jeans, and a comfortable pair of mules and topped it off with my green faux fur jacket for a little bit of a statement. 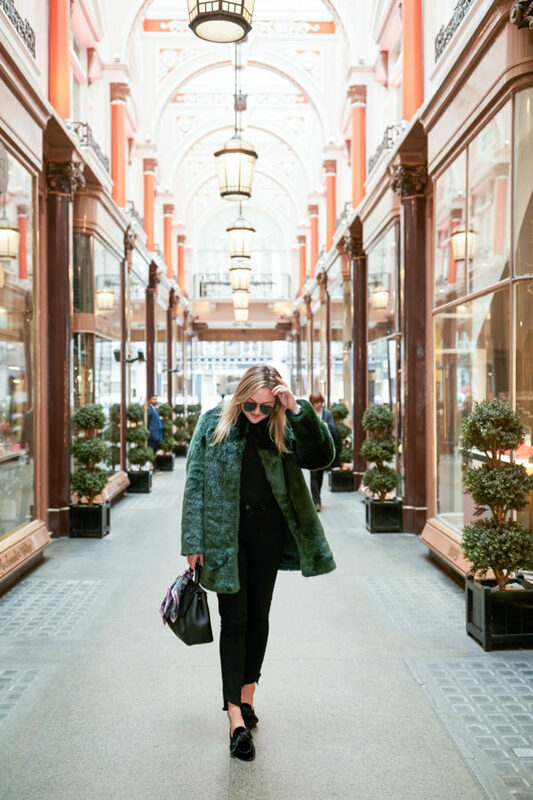 It was the perfect outfit for walking around a few different neighborhoods, lunch at Sketch, and visiting a bunch of shops! 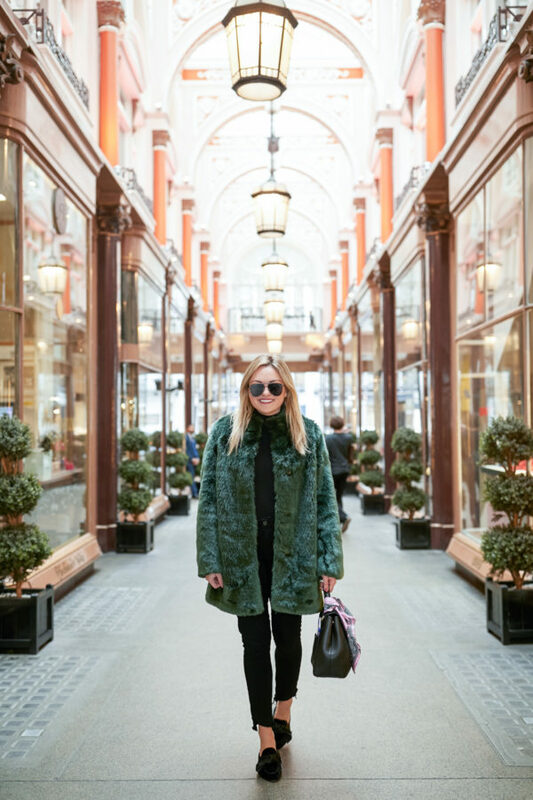 This coat also comes in navy blue and black if either of those are more your style! It’s super warm and seems to be a great quality so far. I got a Medium so I’d be able to comfortably fit thicker layers underneath later this winter. Let me know if you have any other questions about it!